John Winston Lennon was born in Liverpool on October 9, 1940, during the height of WWII, his father, Fred Lennon, off at sea. His father didn't turn up again until five years later, and when he did he tried to take john away from his mother, Julia, when she refused to restart her life with him. Instead, he grew up in the Liverpool suburb of Woolton, with his Aunt Mimi and Uncle George Smith, at 251 Menlove Ave, which became nicknamed Mendips. Julia died in 1958, in an automobile accident practically in front of Mendips, when John was seventeen. Aunt Mimi ran a very strict household. John very quickly became bored at school, preferring drawing and writing about his classmates and teachers rather than his studies. Rebellious at an early age, he had a very rough school history, sagging off from school (going AWOL from classes) and petty stealing. His future looked bleak until Mimi got the headmaster of the Quarrybank school to write a letter of recommendation for John to the Liverpool Art College, because of his drawings. It was at Liverpool Art College, in 1956, a friend played him Elvis' Heartbreak Hotel, and John's musical interest was piqued. Then he heard Lonnie Donegan's Rock Island Line on Radio Luxembourg, and became part of the new Skiffle craze by begging his Aunt Mimi until she broke down and bought him a guitar, although she forever told him he would never get anywhere with it. He had already learned to play the harmonica during his childhood, and he taught himself the guitar by applying banjo chords that his mother had taught him. In 1955 he started his own band, the Quarrymen, with his long time pal and fellow troublemaker Pete Shotton, singing all the popular songs, sometimes making up the words when he couldn't get them all off the radio. Also in the Quarrymen were Nigel Walley and Ivan Vaughan, the rest of John's gang. It was Ivan Vaughan who introduced John to his friend, Paul McCartney, in 1957. John married his girlfriend of four years, Cynthia Powell, in 1962. She was pregnant with their son Julian at the time, who was born in April, 1963. Their marriage was rocky, especially after Lennon began openly dating an older Japanese-American artist named Yoko Ono. Cynthia divorced John in 1968, clearing the way for John and Yoko to begin living and working together full time. Shortly after the release of 1968's The Beatles (aka The White Album), John and Yoko released the experimental "found sound" collection Unfinished Music, No. 1 -- Two Virgins. The cover of this album featured a naked photo of the couple, causing it to be banned from many stores. Lennon and Ono became the subject of media attention as reporters speculated that Ono was "controlling" Lennon and causing trouble for the beloved Beatles. In the spring of 1969, shortly after the trouble-filled Get Back sessions were completed, Lennon and a very pregnant Ono embarked on a "honeymoon" to Europe, stopping along the way to get married in Gibraltar on March 20th. The couple staged a notorious "Bed-In" at the Amsterdam Hilton, where they recorded the single "Give Peace a Chance," released later that year. Opposition to the Vietnam War was very important to the couple, who constantly decried political injustices from their celebrity bully pulpit. The newlyweds returned to England in May 1969, where Yoko had a miscarriage, the first of several. To deal with their anguish, John and Yoko hastily recorded two more avante- garde albums, Life with the Lions -- Unfinished Music No. 2 (which features such "songs" as flipping through various radio stations and several minutes of silence) and The Wedding Album (whose entire B-side consists of John and Yoko screaming each other's name). After recording Abbey Road during the summer of 1969, Lennon flew to Toronto, where he performed at a September rock 'n' roll festival with "The Plastic Ono Band," consisting of Ono, famed guitarist Eric Clapton, German session bassist Klaus Voormann and drummer Alan White; the band's performance was captured on a live album released later that year. As Lennon spent more time collaborating with Ono, he began to distance himself from the other Beatles. In late 1969 he informed the group that he wanted to quit the band, but because contract negotiations were underway with EMI, his decision was kept quiet. Lennon and the Plastic Ono band recorded the single "Cold Turkey," about Lennon's struggles with heroin, but the song was not particularly popular. Lennon intensified his political actions, paying for billboards in various cities that called for the end of war, and returning an award given to him by the Queen in protest of Britain's involvement in Biafra. Lennon refocused on his music career in February 1970 with the Top 10 hit "Instant Karma." Two months later Paul McCartney released his debut solo album and publicly announced the end of the Beatles, angering Lennon, who had first had the idea and wanted to be the one to break the news. Lennon vented his anger with John Lennon/Plastic Ono Band, his first official album, which consisted of highly personal songs often screamed in rage. A few months later, in early 1971, Lennon released the protest song "Power to the People." In the spring of 1971 Lennon and Ono relocated to New York City, moving into the Dakota, an historic apartment building on Central Park West. Lennon wasted no time becoming involved in American society, siding with Chicago Seven political radicals and frequently speaking out on political issues. That fall Lennon released his most popular solo album to date, the No. 1 charting Imagine, which dealt with personal and political issues in a more accessible manner than his earlier works. In early 1972 Lennon began fighting off U.S. Immigration Authorities, who had denied him a work visa due to a 1968 conviction for marijuana possession. Partially in protest, Lennon collaborated with the radical New York band Elephant's Memory on the album Sometime in New York City, a simplistic political work which is widely regarded as a commercial and artistic failure. In 1973 the INS ordered Lennon to leave the U.S.; Lennon refused, and began publicly attacking the agency. Later that year Lennon released the surprisingly tame Mind Games, whose title track was a minor hit. In 1974 Lennon separated from Yoko Ono, relocating to Los Angeles. For the next two years Lennon became heavily involved in drugs, and became a frequent attendee of celebrity parties and wild night clubs. Through the party circuit Lennon developed a friendship with Elton John, with whom he co-wrote the song "Whatever Gets You Through the Night," Lennon's 1974 No. 1 comeback. The single was featured on the album Walls and Bridges (which also reached No. 1). On Thanksgiving night Lennon joined John onstage at Madison Square Garden, a legendary performance which turned out to be Lennon's last public concert. 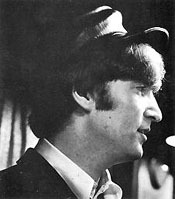 The following year Lennon recorded a contractual obligation album, Rock And Roll, a collection of cover tunes from the 1950s. Several months before the official release of the album, businessman Morris Levy released a bootleg of the record as Roots. Lennon later sued Levy, winning a large judgment in court. By the end of 1975, things had turned around for Lennon: Elton John had helped John and Yoko resolve their marital differences, and in early October an appeals court overturned the deportation order which had been haunting Lennon. The following year Ono became pregnant yet again, and on October 9, 1976 (John's birthday) gave birth to their child, Sean. After contributing to a David Bowie album in the summer of 1976, John retired from music to raise his child and tend house, while Ono handled the family's complicated business and legal affairs and worked on her conceptual art. In early 1980 Lennon came out of retirement and signed a new record deal with Geffen. John and Yoko recorded a new album that summer, Double Fantasy, which was released in November. 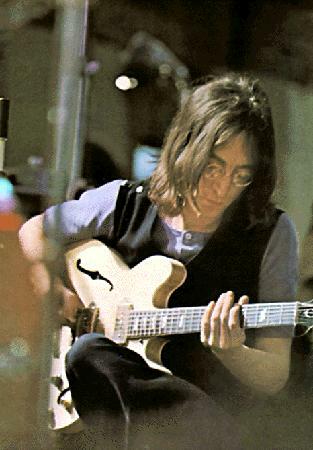 The highly listenable album and its first single, "(Just Like) Starting Over," both charted, and Lennon seemed to be on the verge of a comeback. While leaving his New York apartment on December 8, Lennon was approached by a sleazy-looking fan who requested an autograph. When John returned home several hours later, the fan was still outside his apartment, and shot Lennon several times. He died minutes later, and the crazed fan, Mark David Chapman, was quickly arrested. On December 14 at 2 p.m., Lennon fans around the world participated in a widely publicized 10-minute silent vigil. Naturally, Double Fantasy and "Starting Over" went to No. 1 and sold thousands of copies. As Chapman went to trial, bizarre details came out about the disturbed loner, who apparently was obsessed not only with Lennon, but also with the popular novel Catcher in the Rye. He was easily convicted and sentenced to an indefinite term in a mental institution. In the years following Lennon's death, his cult only grew. During the mid-'80s Capitol released several albums of unreleased songs, including 1985's Milk and Honey and a recording of Lennon's performance at a 1972 benefit concert, among others. 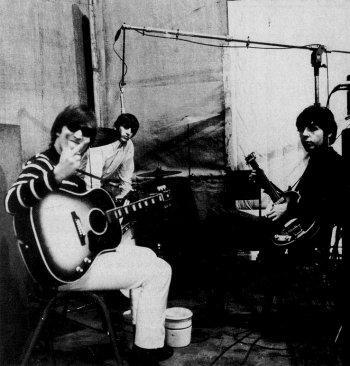 In the ultimate exploitation of Lennon rarities, in 1995 and '96 the remaining Beatles recorded music over two "new" Lennon home demos from the late '70s; "Real Love" and "Free As a Bird." These tracks appeared on the 1996 Beatles Anthology albums as "new Beatles songs."